The act of gardening is deeply intertwined into the history of mankind. In fact, according to the article, “A Brief History of Gardening” by Tim Lambert from www.localhistories.org , gardening dates back to ancient times when it was completed for practical reasons, such as growing herbs and vegetables as a food base. Yet, Lambert goes on to mention that as time moved forward ancient Egyptians expanded upon this life preserving task, and turned gardening into more of a luxurious attainment for the wealthier populations. For well-off Egyptians, they now were able to grow larger enclosed gardens containing trees to shade them, vineyards to enjoy the spirits, and fragrant flowers to indulge in their enchanting natural perfumes. As time has progressed, gardening has become even more elaborate. However, there is something to be said about going back to the basics. With that in mind, gardening does not have to be something that is only obtainable for the affluent. On the contrary, gardening is something that is achievable and accessible by all. Furthermore, gardening allows individuals and families to learn skills that will help them to secure healthy and delicious meals for their entire family on a fairly small budget. Unlike going to a big box store where prices are increased to make a profit, gardening removes this middle man process, and allows the gardeners themselves to decrease this cost dramatically; thus saving money for other needed expenses. In addition to the saving aspect of gardening, there is the benefit and satisfaction of growing your own food. It is an empowering and rewarding feeling knowing that you created your own food source. Not to mention, it provides peace of mind knowing that you are completely aware of what items and/or ingredients are in/on your food; for example, if you grow the lettuce and cucumbers that comprise your salad, you can guarantee that no dangerous chemicals are being added to your meal. If these benefits sound like something you would like to acquire, then the Creating Healthy Communities (CHC) Program at the Meigs County Health Department has just the thing for you. Over the years, the CHC Program has helped to establish community gardens throughout Meigs County; even better, these gardens are free and open to the community. Often individuals do not have the space or gardening materials and tools to form a garden on their own, however the CHC Program with the generous partnership of the community helps to alleviate this barrier by providing a gardening space and tools. Currently, the CHC Coalition is working on establishing an edible orchard. In 2019, the CHC Program hopes to implement another community garden in Middleport. With that in mind, the CHC Coalition is curious to know if this community garden is a project that Meigs County residents would be interested in. A great deal of effort and money is put into CHC projects, therefore the Coalition wants to know if this use of resources is best placed in creating another garden. This potential garden would need community members to not only use, but maintain up-keep of the garden. After all, a community garden is only as successful as the community who utilizes and maintains it. In order to have your voice heard, please contact me, Ciara Martin at ciara.martin@meigs-health.com, or consider attending our upcoming Coalition meeting on Wednesday, Dec. 5, 2018 from 1-2 p.m. at the Meigs County Health Department. To learn more about the Creating Healthy Communities Program, and other services offered at the Meigs County Health department please visit these two sites, www.meigs-health.com and www.healthy.ohio.gov/chc. 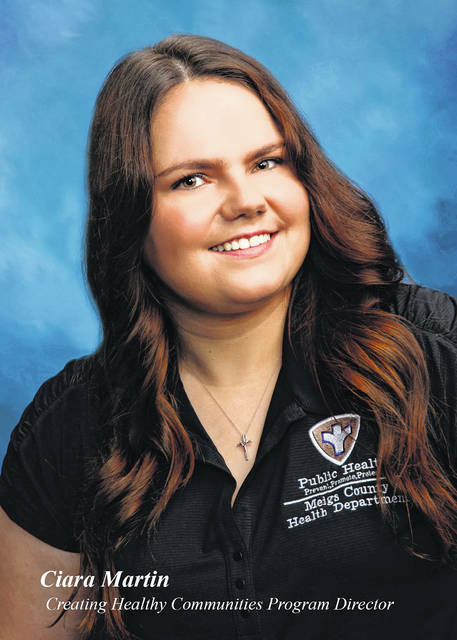 Ciara Martin is the Creating Healthy Communities Project Director at the Meigs County Health Department.